The iLESSYS® set contains all instruments for a safe interlaminar minimally invasive access to the spinal canal and the removal of herniated disc, bone or tissue material. For easy handling the access instruments are color coded. The access occurs in 3 steps. Under X-ray control the tissue is dilated gradually. After placing the working tube, under endoscopic view the ligamentum flavum is opened. Herniated disc material can be removed through the laminoscopeTM. If required, bony structures can be reduced using abrasors. The Full HD laminoscopeTM is available in two versions, the C version with modern single cable technique and the D version with dual cable technique (ocular connection). They have an outer diameter of 6.3 mm, a working channel of 3.7 mm, a viewing angle of 30° and irrigation and suction channels, both with inner diameters of 1.5 mm. Both endoscope versions are available in two lengths: 171 mm and 125 mm. C version: user friendly, combined camera cable adapter for camera and light source in single-cable technology. Designed for joimax® cameras of all generations. D version: two cable technology. Camera and light source have separate cable, designed for connection to most of the other commercially available camera and light source systems. Our forceps are equipped with the patented `Luer Overload Protection System – LOPS´, which prevents overstretching, thus guaranteeing long-lastingness. The Endo-Kerrison punch is designed for the removal of e.g. bone, capsule tissue and ligamentum flavum under endoscopic view. It has an interchangeable shaft and is available in two versions (90° or a 40° cutting angle). Bony structures can be easily removed using the diamond abrasor. Each surgical operation requires a variety of disposable materials. 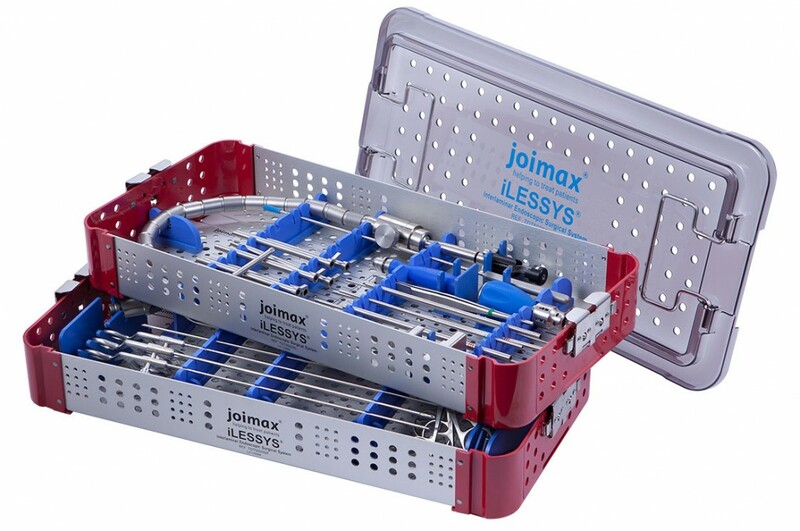 To keep the workload as low as possible, joimax® has developed a special kit containing these materials. Therefore, the time and organizational expenditure is kept low and the sequence of the endoscopic surgery facilitated. The set contains all the necessary products for single use such as puncture needles, needles, syringes, dishes, marking pen, scalpel, guide wires and endoscope cap. The needle wire set includes a siliconized needle for easy access through the tissue and a NiTiNOL wire that serves as a guide wire during surgery.